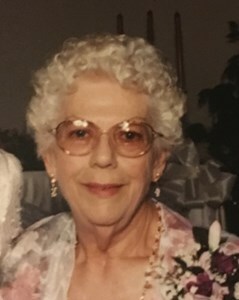 Doris Ann (Jorsch) Oberhuber passed away peacefully at her residence at McCormick Assisted Living Home in Green Bay, Wisconsin on Thursday, August 30, 2018 at the age of 88. She was born in Sheboygan, Wisconsin on November 19, 1929, a daughter of German-Russian Immigrants, Jacob Jorsch and Elizabeth (Markgraf) Jorsch. Doris was a mother to five children of her own, stepmother to five children, and a grandmother, great grandmother, and great-great grandmother to many more. In her younger years, Doris enjoyed singing as a member of the Sweet Adelines. She worked in the printing department of Leverenz Shoe Company in Sheboygan, before “retiring” to become a full time homemaker and mother. She loved country music, campfires, steaks on the grill, and shopping at the Piggly Wiggly. Doris knew how to mix a decent Martini and a mean Manhattan. She relaxed by watching her “stories” - Guiding Light and As The World Turns, and spending late summer afternoons on the patio reading her “gossip rag mags” – The Star and The National Enquirer. After enjoying several years of camping with their family, eventually she and Wally bought a cottage just north of Crivitz, Wisconsin, in an area fittingly named Sweetheart City. Years passed and Doris and Wally decided to turn this cottage into a permanent home, and then, even though she never had the official title, Doris became the CEO and CFO of the family business, Oberhuber Construction. When her two youngest daughters were ungrateful teenagers, Doris could often be heard telling them, “You don’t need to go on vacation anywhere! You are lucky that you LIVE in vacationland!” After Wally’s death in 1997, Doris moved to the Green Bay area to be closer to family, including the daughters who used to be those ungrateful teenage girls. Above all, Doris was a mom. She was not only a mom to her own kids, but she was a second mom to her children’s friends, her nieces and nephews, and her grandchildren. Doris knew that being a mom was the most important job in the world – it meant being the one person who is always there for your children and who never turns your back on them, no matter what kind of fine messes they have gotten themselves into. Her love and support for others was unconditional. Doris was preceded in death by her husband, Walter Oberhuber; parents, Jacob and Elizabeth Jorsch; sister, Lillian Madsen; brother, Edwin Jorsch; son, David Oberhuber: stepdaughters, Vicki Oberhuber and Linda Kopp; and daughter-in-law, Pamela Hense. She is survived by her children, Ann (Tom) Kaat, Thomas Hense, Kimberly (Larry) Zastrow, and Karrie (Jason) Minor; stepchildren, Judy (Jack) Brandl, Bonnie Mott, and Roxann Wieting; grandchildren, Shannon (Benjamin) Walker, Dion (Rizel) Hense, Sarah (Robert) Whalen, Thomas Hense II, Jacob (Michelle) Hense, John Hense, David Oberhuber II, Nathan (Kim) Oberhuber, Robert Volm III, Zachary Volm, Maxwell Zastrow, Mackenzie Oberhuber, Cody Oberhuber, Rachel Minor, Jolene (Jeff) Schneider, Stephanie Brandl, Tony Brandl, Dawn Kopp Whipple, Todd (Chris) Oberhuber, Debbie Barbeau, Roxanne Barbeau-Jakubowski, Anthony Barbeau, Rebecca Schmidt, and Rhonda Wieting; many great-grandchildren, and a few great-great grandchildren. Visitation will be held at Newcomer Funeral Home at 340 S. Monroe Avenue in Green Bay, on Wednesday, September 5, 2018 from 3pm until 6pm, with a short prayer service at 6pm. Add your memories to the guest book of Doris Oberhuber. You were 16 when I was born and all these years you gave me advice and encouragement, sometimes things I didn't want to hear but I treasured everything.